Households in Singapore can look forward to more choices when buying electricity, thanks to the Open Electricity Market. Here’s what it is and what it means for you. Earlier this year, Jurong resident Jay Tan, 31, made the switch to an electricity retailer’s Discount Off Regulated Tariff plan which offers a fixed discount of 20% off the regulated tariff. Jay shared that “the decision to switch was a no-brainer to me, since I would always be paying a discount compared to what I am currently paying. The retailer also offers short 6-month contracts, so I have the freedom to switch in half a year if another retailer offers an even cheaper plan”. Do you know that you will soon have a choice to buy electricity from a retailer? For Singapore households, this can be a little unnerving since we are used to buying electricity from just one company – SP Group – at the regulated tariff. With the impending launch of the Open Electricity Market (OEM) island-wide, Singapore households will be able to buy electricity from a retailer at a price plan that suits their needs. OEM is part of EMA’s efforts to liberalise the electricity market. This will allow households in Singapore to buy electricity from retailers other than SP Group. Think of how the telecommunications companies in Singapore, such as SingTel, M1, Starhub and Circles.Life, offer different price plans. But unlike the telcos in terms of infrastructure, there is only one company – SP Group – responsible for operating the national power grid in the electricity market. SP Group will still continue to deliver electricity to everyone under OEM, regardless of who they sign up with. On 1 April 2018, OEM was soft launched in Jurong, allowing more than 100,000 households there to choose their preferred electricity retailer and plan. Consumers in the rest of Singapore will enjoy this same choice when OEM rolls out nationwide from the second half of 2018. This will involve the remaining 1.3 million accounts, comprising mainly households and small businesses. Let us take a closer look at two key areas and how this may impact you when the electricity market opens up. The electricity price that you currently pay is based on the regulated tariff reviewed by SP Group and approved by EMA. The regulated tariff reflects the efficient long-term costs of producing and delivering electricity in Singapore’s electricity market. Historically, we have seen fluctuations in the regulated tariff based on global market conditions such as the cost of natural gas prices used for electricity generation. With OEM, you will be able to buy electricity from retailers. These retailers can set prices according to their business strategies, current market conditions, as well as the level of competition in the electricity market. Singapore’s electricity market has always been a dynamic eco-system made up of multiple players. Everything starts with the electricity produced by power plants, which are owned and operated by power generation companies. Every half an hour, these power generation companies bid to generate and sell power in the wholesale electricity market. The electricity generated is then transmitted from the power plants and distributed across the island through the national power grid . 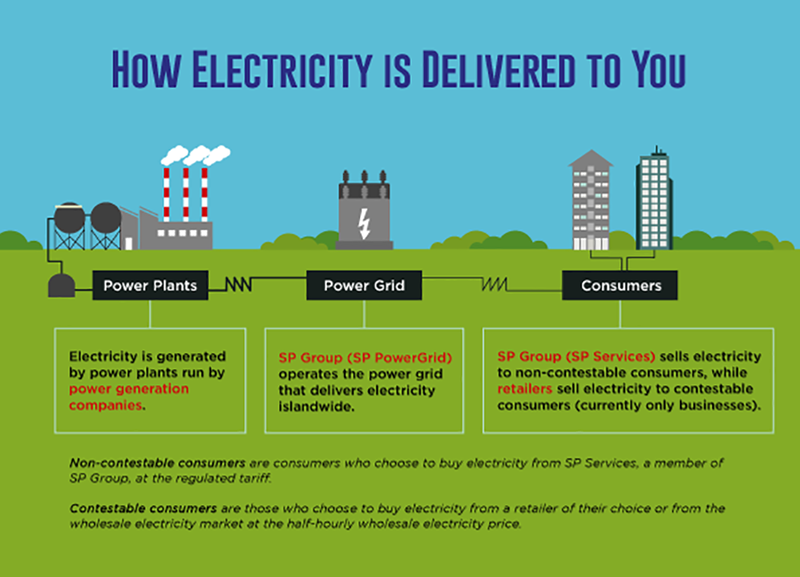 SP Group operates the national power grid and is responsible for delivering reliable electricity supply island-wide. How does this impact you in OEM? What this means is you can be assured of the same reliable electricity supply that you enjoy today even after you switch retailers. 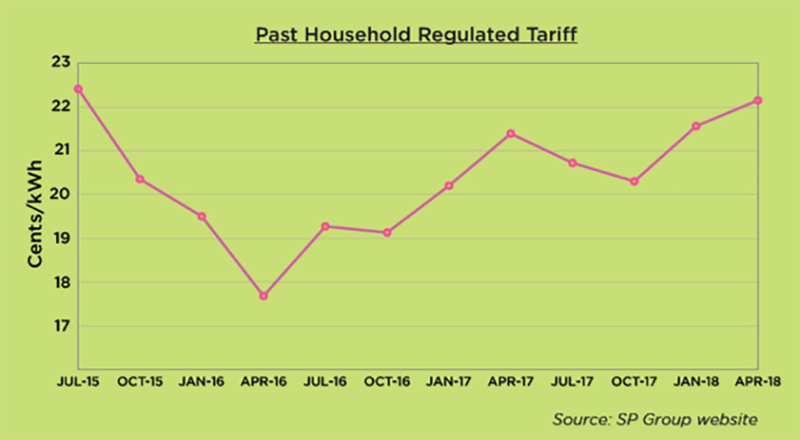 Compared to paying the regulated tariff, retailers will offer various price plans targeted at consumers with different needs. This gives you the choice to decide who you wish to buy electricity from. As seen in the Jurong soft launch, retailers are offering attractive sign-up discounts and promotions. Beyond price, they are also competing to value add by bundling their price plans with other products and services. This means consumers will stand to benefit from competition among retailers. As retailers strive to differentiate themselves, you can look forward to even more offerings and perks, and choose a price plan that makes the most financial sense for you. In order to help you make an informed decision, all retailers are required to provide a Fact Sheet on your preferred price plan. Look out for important contractual terms like the contract duration, payment terms, security deposit and early termination charges. If there are any clauses or fine print in the contract that you’re unsure about, ask the retailer to explain these to you. As with all contracts, you should keep a copy for future reference. The introduction of OEM have made Singaporeans more aware of the electricity market in Singapore and to take stock of their own consumption patterns. Ultimately, how much savings you stand to gain from switching to a retailer depends on when and how much your household uses electricity. Being more conscious of when we use electricity, the appliances most often used, and areas of wastage will hopefully lead to more considered electricity use. This will save both money and natural resources over time. The nationwide roll-out of OEM is on the horizon, with EMA targeting to extend the initiative to the rest of Singapore from the second half of 2018. For now, what Singaporeans can do is to first familiarise themselves with the standard price plans offered by retailers and what to look out for when switching to a retailer. At the same time, it’s good to take a closer look at your latest SP Group bill and to better understand your household’s electricity usage level. We can also help to educate the people around us about what OEM is (and is not), and to help them make an informed decision when the time comes. Remember, it is not compulsory for you to switch – if you prefer, you can always continue to buy electricity from SP Group at the regulated tariff. Let’s look forward to exercising our power to choose and enjoy a plan that truly suits our needs. Why Does Coca-Cola Light Cost More Than All The Other Coca-Cola Flavours?